This kit includes: 1 Fuser, 1 Manual Feed pickup roller, 1 Manual Feed separation pad, 2 Cassette feed/separation rollers, 1 Cassette pickup roller. You can save some money by purchasing the fuser on exchange ; see exchange terms in details below. This kit is intended for use in the HP Color LaserJet 5500 series (NOT the Color LaserJet 5550). Alternate part number C9735A, RG5-6848, C9656-69001. 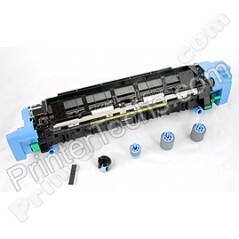 This kit is for use in the Color LaserJet 5500 series, NOT the Color LaserJet 5550 series.